Back in October we celebrated my Cooper’s first birthday party. If you’re new around here Cooper is my baby, my second child and one of two boys. I wanted to make his birthday party extra special and I decided to go with a woodlands Theme. I love woodlands. I decorated my first son’s nursery (his name is Locky) in Woodlands cuteness. I miss that nursery so much. As part of the decorations I wanted to have a large number one in there somewhere and moss was just a must for some reason. I couldn’t move past the idea, so I went with it. I wanted the number to really stand out and be a bit different. When I walked past my local florist and saw some beautiful moss in their window display I knew I had to get my hands on some of that moss and cover the number one in moss. It was meant to be! Pretty sure my florist now thinks I’m a weirdo for buying moss randomly but I’m so glad I went with the idea because it looked great and really made the whole theme come together as I used a little moss on the table display also. I’m all about making simple projects. With two small children (sixteen months apart) running around the house I don’t have time to spend hours on end on one individual project, not at the moment anyway, so I found this project to be surprisingly easy and quick. Be warned though, it’s a messy project but well worth the end result! First thing you will need to do is draw up your large number one. I sketched directly on an old piece of foam board I had laying around that I used to spray paint small objects. I sketched with a pencil until I got the number to look the way I wanted it to. 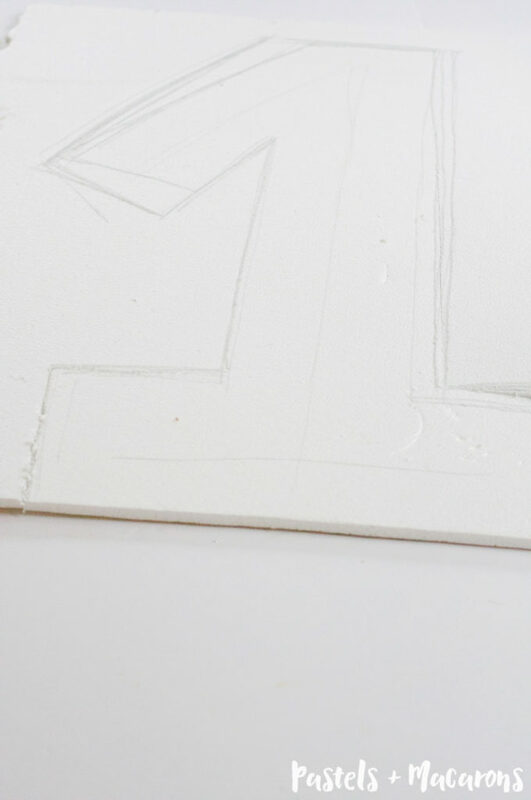 Cut the outline of the number with an Xacto Knife. 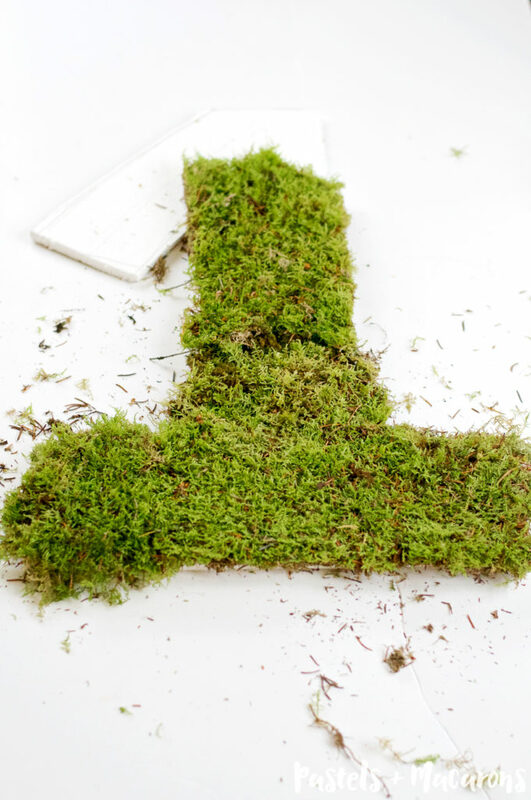 Once your number is cut, you are ready to glue on your moss. This is where things get messy. There is no right way about this step. 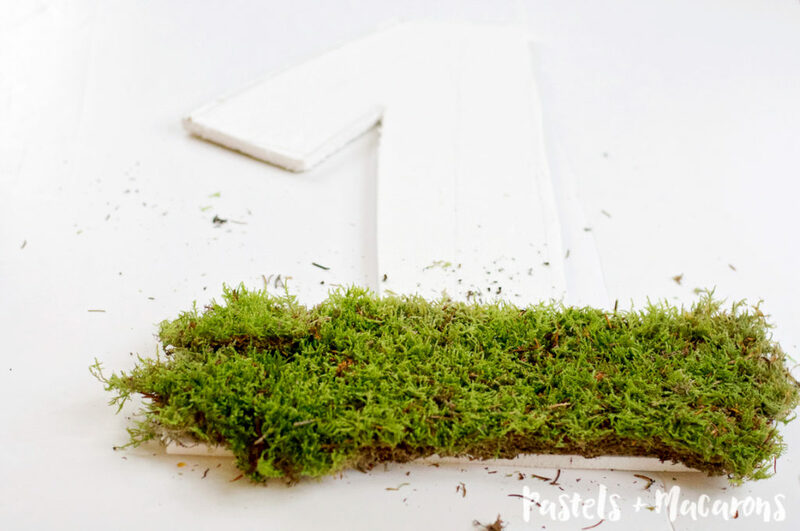 You need to place your moss the best way you can on the number until you cover the entire area. 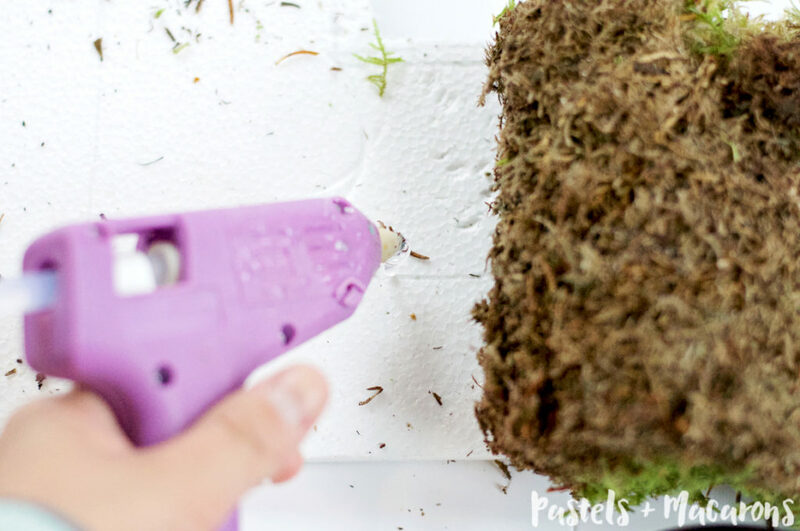 Hot glue the moss on as you go along. 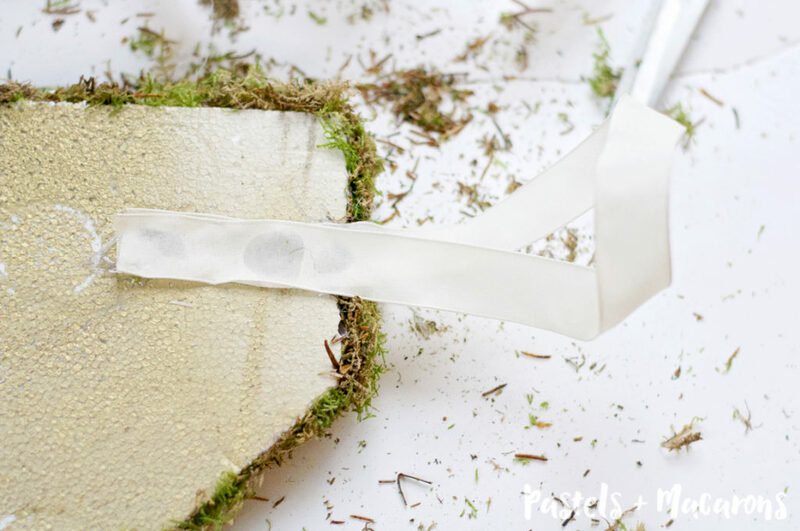 Even if you need to cut parts of the moss and glue them in small pieces (I did this for the bottom corners of the number) this is ok. Just glue it all close together and you won’t see where you have cut into the moss. Once your entire number is covered and glued on, grab a pair of scissors and cut the outline so that all the edges look nice and neat. The final step is to hot glue on your ribbon if you wish to hang the number. 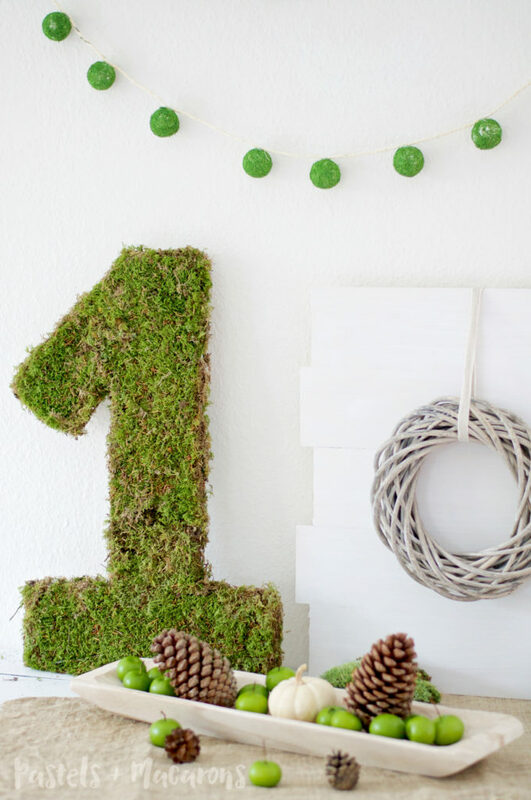 This number will easily hang as it doesn’t weigh anything so it can very safely be hung on a wall with a thumb tack. 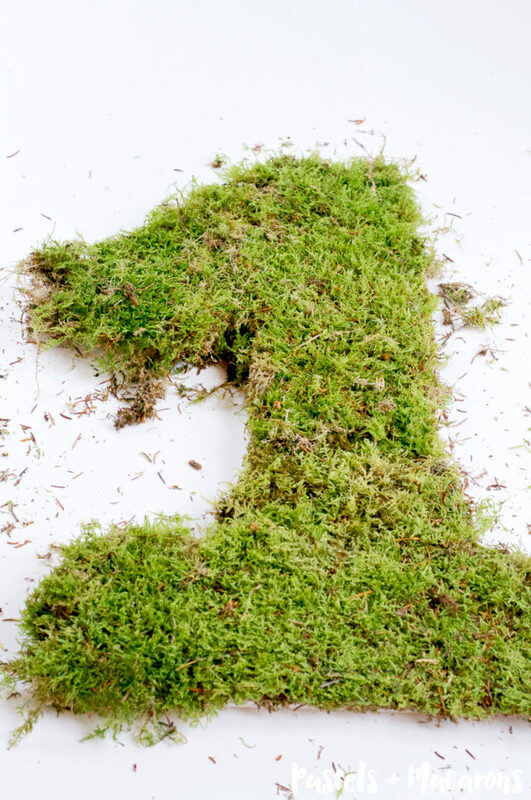 *Depending on the type of moss you get will depend if you need to clean the base of the moss or not. 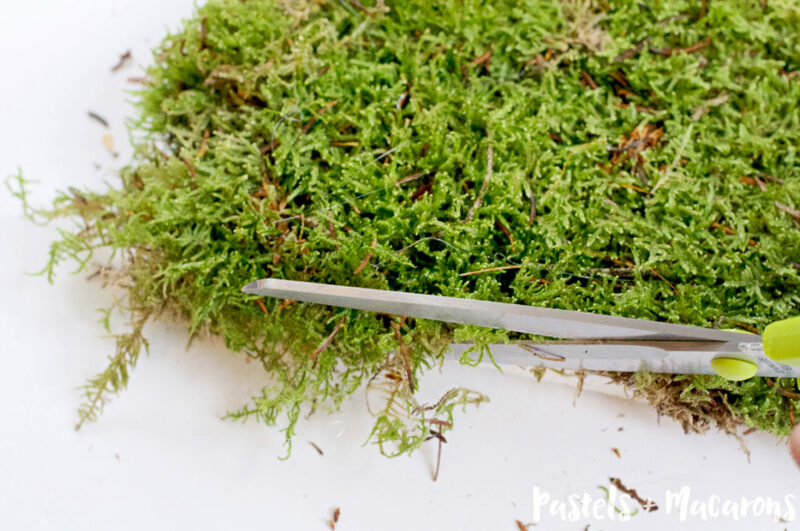 I found there was a lot of thick dirt stuck on to very fine little roots so I cut into this layer with my scissors and was able to glue the moss on with ease. 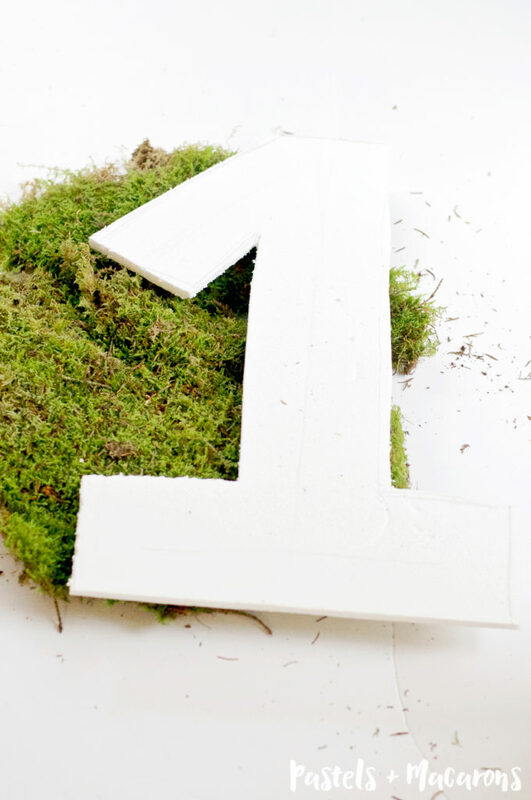 The number was one of my favourite parts of the party decor but then again I do have lots of favourites from the party! I was very happy with how it all came together. If you want to see the entire Woodlands Birthday Party. I’ll be posting the party in the new year as there is just too much going on right now with christmas to post it now. 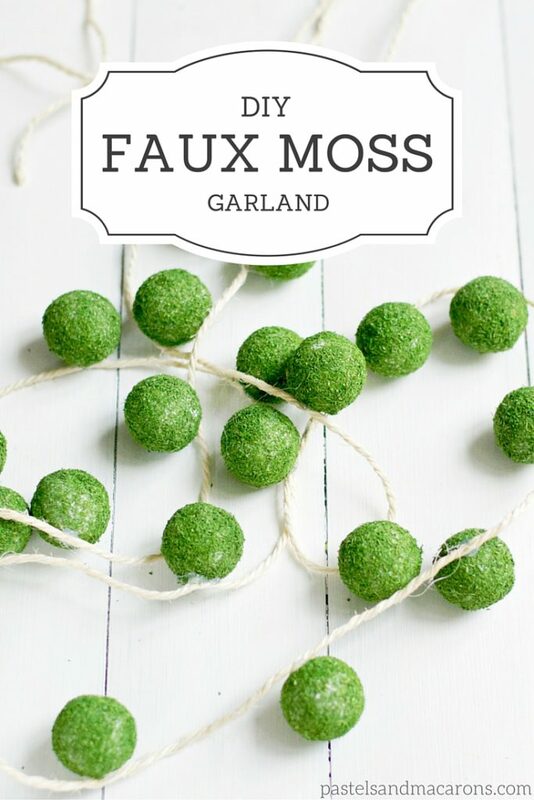 Have you every made anything using moss? Would love to know what you’ve made?? If you like this post then you may also like some of my recent DIY & Craft Projects! This looks so cute! And it would be cute as an initial, too! Our last name is Johnson and a big moss J would be so cute! Thanks Amy! Thank you for pinning. Very neat! Great birthday theme and ideas. Pinning for future. Visiting from #MerryMonday link party. Thanks for pinning! It was a very fun party to put together! This is adorable!! ..and so versatile!! I’m picturing it as either a front door hanger with our last name initial or a number for the number of people we have in our family to use in the family room. Thanks for sharing!! That is so beautiful! I also love woodlands themes!! 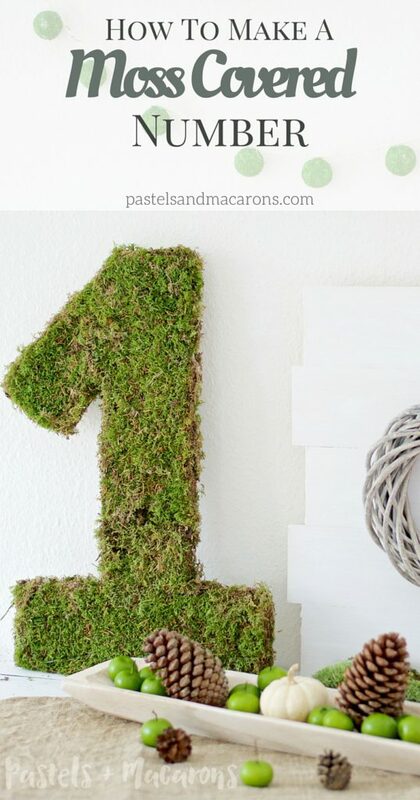 Maria, I love moss letters and numbers and yours is no exception (pinning to share) but I especially love how you photographed the vignette you have it display in. Nicely done and so pretty! 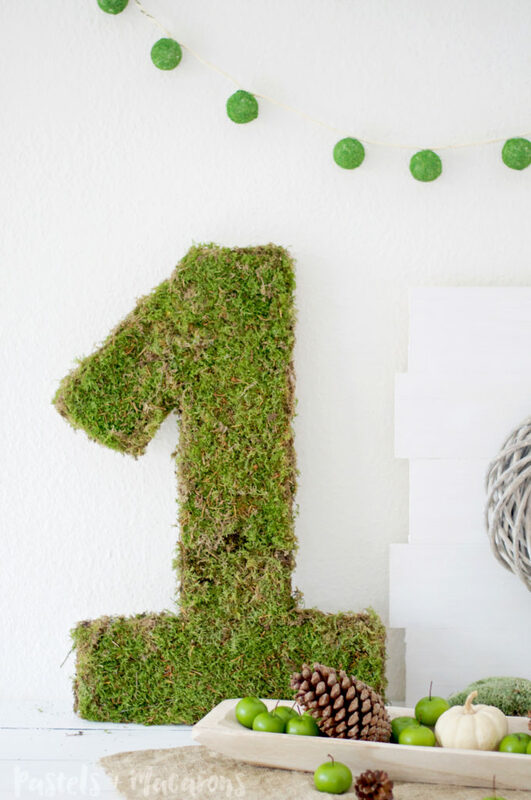 Maria, I’ve covered styrofoam balls with moss, but I’ve never thought of a number. Such a cute idea. I used spray adhesive for my balls and it worked really well. Great idea on spray adhesive. Yes, the number idea is cute 🙂 Thank you! This party looks like it was a lot of fun! 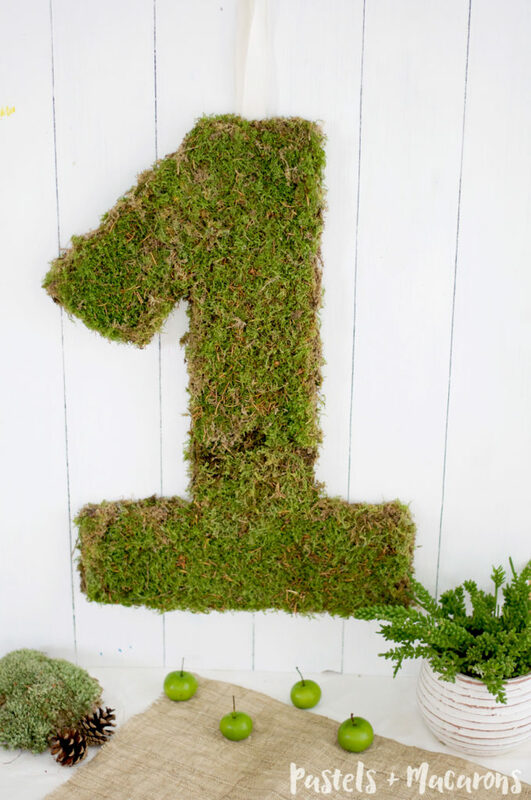 I really like this moss covered number one, too! In smaller sizes, it could work well as decor,too! Hi Kate, it was so much fun! Loved putting it together. 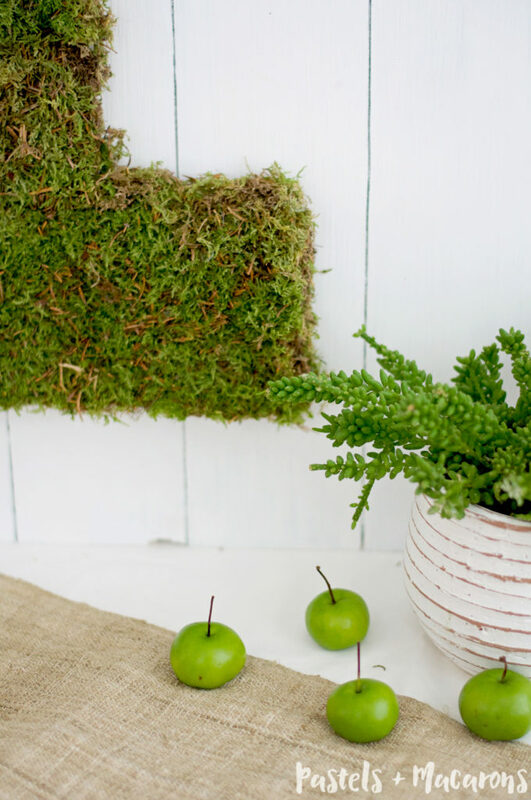 Yes, the moss numbers can work in many ways. 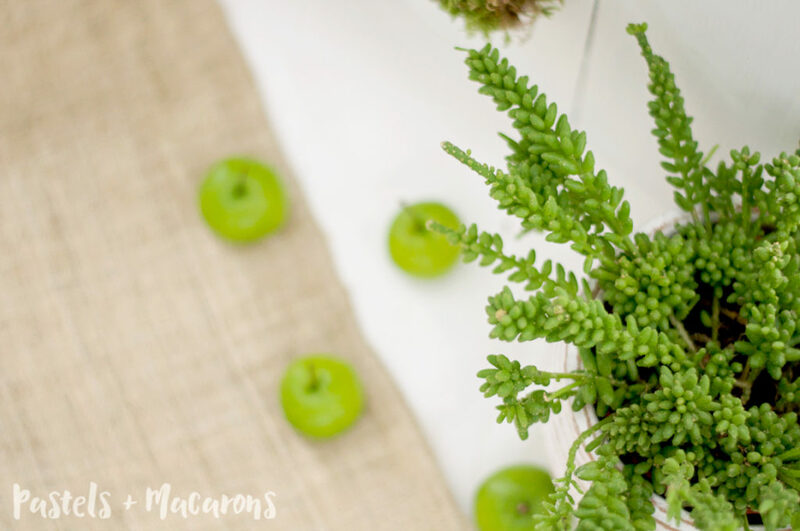 If you make them small you can use them as wall hangings or even numbers on wedding tables for a rustic wedding theme.